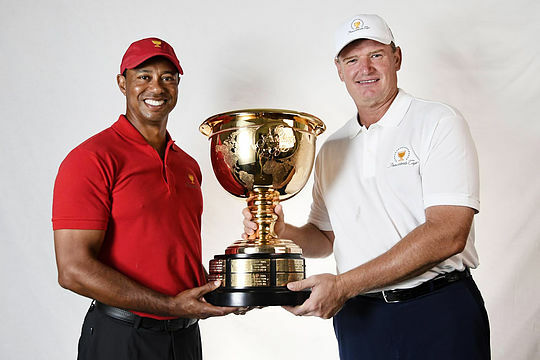 Ernie Els and Tiger Woods have been named captains of the International and US Teams respectively for the 2019 Presidents Cup held at The Royal Melbourne Golf Course in Melbourne, Australia, officials announced today. While both will be first-time captains at the event, the two are the most experienced captains in terms of Presidents Cup competition and were the primary figures in the 2003 event held in South Africa, where Woods and Els competed in a dramatic sudden-death playoff that ultimately ended in a tie and the two teams sharing the Cup. Els has competed in the Presidents Cup eight times, tied for most by an International Team member. Woods, also an eight-time US Presidents Cup Team member, holed the winning putt for the United States in 2009, 2011 and 2013 – the only player to clinch the Cup three times. In addition to the announcement of the two captains, officials also unveiled minor changes to format requirements and eligibility for the 2019 Presidents Cup. Each player shall play a minimum of one match prior to the final-round singles matches. This is a change from past years where players were required to play twice during the same timeframe. Additionally, the top eight players for the International and US Team standings will officially qualify following the completion of the 2019 TOUR Championship. Captains will later select four captains’ picks (at date to be determined) closer to the December 2019 event. Els is tied with Vijay Singh and Adam Scott with eight appearances in the event with an overall record of 20-18-2. He is tied for most all-time match appearances on the International Team in Presidents Cup history (40, Vijay Singh) and has won more matches than any other International Team member (20). The World Golf Hall of Fame member has 19 career PGA TOUR victories to his credit, including four major championships between the US Open (1994, 1997) and The Open Championship (2002, 2012). Woods has a Presidents Cup record of 24-15-1 since his first appearance on the 1998 US Team, and he is one of five players to go 5-0-0 during a single event (2009). His 24 matches won ranks second all-time to Phil Mickelson’s 26, and his six victories in singles matches is the most in the event’s history. The 2019 Presidents Cup will be held from December 9 to 15 when it returns to the prestigious Royal Melbourne Golf Club. The return to Melbourne, Australia, will mark the third time in the biennial event’s 25-year history it has been held at the renowned Sandbelt course, as the event was previously held in Melbourne in 1998 and 2011, also at The Royal Melbourne Golf Club.